"God, the World, and I" was published by Liberty University Press earlier this month. Books from all over the continental United States bear the Liberty University Press stamp, and now a new book from Hawaii will as well. "Crystal Castillo, author of “God, the World, and I,” is the first writer from the Central Pacific to have her book printed by the emerging publishing company. 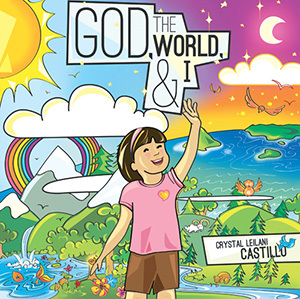 Castillo’s new children’s book, “God, the World, and I,” tells the story of a child who explores her role in the world and her responsibilities as a young Christian. Through colorful illustrations and easy-to-read text, Castillo encourages young readers to grow deeper in their faith and discover more about their Creator. “God, the World, and I” can be purchased via Amazon or Barnes & Noble. Crystal Leilani Castillo is currently a graduate student at Liberty University and a U.S. Army Reservist. Born and raised in Hawaii, Castillo has one daughter, Leilani, who is featured as a character in “God, the World, and I.” Crystal gives all the glory to God for being able to use her life experiences as the basis of her stories and to teach valuable, Christ-centered lessons to children. Hannah Coward is an illustrator and graphic designer from Charlotte, N.C. She grew up in Southeast Asia as the daughter of community development organizers, and earned her Bachelor of Science in Graphic Design from Liberty University. Coward currently lives in West Virginia with her husband and one-year-old daughter, working as a freelance designer while pursuing her Master of Fine Arts at the Academy of Art. The tropics are part of her own heritage, and she enjoys using bright colors and Asian pop-art aesthetics in her work.